Originally built in the early years of the 17th century, Nijo Castle was once the residence in Kyoto of the Edo Period’s first shogun, however after the fall of the Tokugawa Shogunate in the 1860s the castle was used by the Emperor of Japan before finally being given over to public use as a site of historical interest. In 1994, the castle was given UNESCO world heritage status as it is possibly the best example to still be standing of the Japanese feudal era’s castle palace architecture. 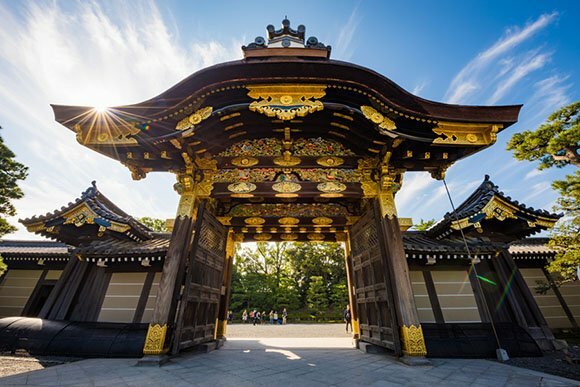 Visitors can rent an audio guide which will help them to discover the history of the site and of the Ninomaru Palace which stands in the grounds and which was once the shogun’s private residence. There is also a traditional landscape garden with ornamental stones and a large pond, tree-lined pathways and a stunning cherry orchard of almost 400 trees which are in full bloom between March and April as well as a plum orchard which blooms between February and March. Cultural events like tea ceremonies are held in the Seiryuen and during November, the castle grounds are resplendent in Fall colors thanks to the ginkgo and maple trees which boast spectacular autumnal leaves.